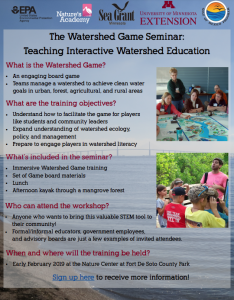 Exciting Opportunity – Watershed Game Teacher Seminar! 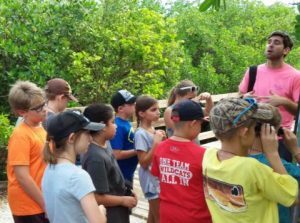 Nature’s Academy, in partnership with University of Minnesota Extension and the Environmental Protection Agency, is bringing a hands-on watershed education tool to the Greater Tampa Bay area! The Watershed Game was developed and published by University of Minnesota Extension and Minnesota Sea Grant. This interactive, lecture-free tool helps individuals understand the connection between land use and water quality. Participants learn how a variety of land uses impact natural resources, increase their knowledge of best management practices, and learn how their choices can support positive change. Participants apply plans, practices, and policies that help them achieve water quality goals in their area of management and in the watershed as a whole. 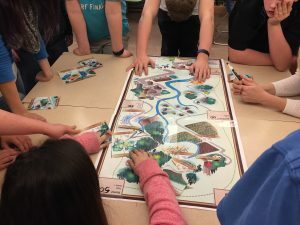 University of Minnesota Extension and Minnesota Sea Grant have developed both a local leader and classroom version of the Game. Through our partnership with the EPA, Nature’s Academy will be hosting a train-the-trainer event at Fort De Soto County Park in early February 2019. By attending this seminar, participants will learn the ins and outs of gameplay, enhance their watershed literacy, and be fully prepared to use this tool in the community for students of all ages! Minnesota Extension staff will be providing instruction for both the classroom version and the local leader version, which is best suited for adult players. Invited seminar attendees include formal and informal educators, advisory boards, and government employees. Fees are sponsored by the EPA. Attendance includes game board materials, lunch, and an afternoon kayak through a mangrove estuary. Sign up here to receive more information about the event. It is through partnerships like these that we are able to provide the community with such valuable tools of change! Download the Watershed Flyer Here!